It's been a little while since our last Toolbox Tuesday blog post. With all of the hectic fervor surrounding the last few months, we've been pretty lax in sharing some of our latest purchases, finds, and favorite items. I think it's about time to dust off the old Toolbox Tuesday belt and turn you onto a can't miss item that I recently tried out for the first time. 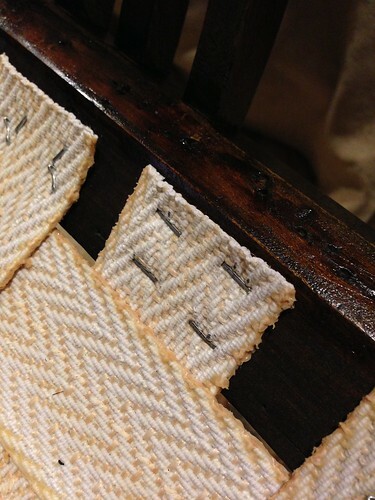 A few weeks ago I touched very briefly on the new staple gun we picked up to complete the webbing project on Wendy's Great-great-grandmother's chair. I figure this little stapler performed so nicely on our project that it's a great tool to get us back on the tool review horse. Last year Wendy did a review on an electric stapler we've owned for about nine years that, until a few weeks ago, we considered to be the best tool for our stapling needs. It wasn't until I started using it to staple thick chair webbing into the hard old growth wood of the antique chair that I began to notice just how hard of a time the stapler was having doing its job. From mangled staples to constant misfires, it was less than ideal. 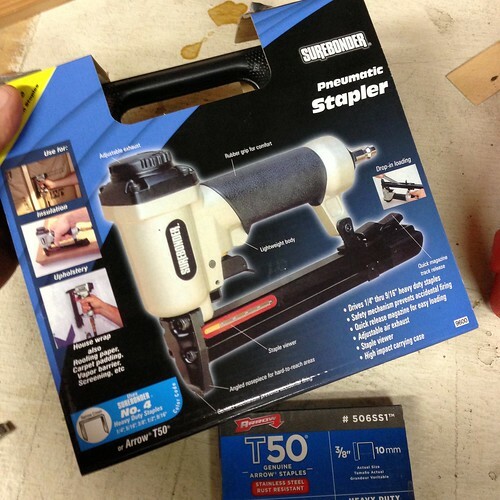 Rather than trying to just make do with the poor results from our electric stapler, I decided I hadn't been following my "one new tool for every project" rule and I should absolutely pick up something to make my life easier. 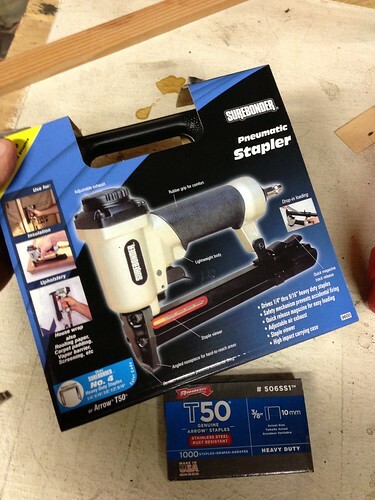 Since I already have an air compressor, I figured it was high time to pull the trigger, so to say, and buy us a pneumatic stapler. I'd long thought about buying one of these but have put off for quite some time because I figured it was cost prohibitive for the amount we'd actually use it. It wasn't until I started searching on Amazon that I realized just how inexpensive these tools could be. The rough range in cost seemed to be anywhere from about $20 to roughly $80. Granted, the more expensive models were not "cheap" at $80, but the low end seemed rather nice as long as the quality was decent. I started to read all of the various Amazon reviews and look up reviews on various tool sites. Some were refurbished units, while others were simply low cost options, but the more I read the more I saw the same things said, "Great tool, great price, does just what I need." When I unpacked the stapler I was really surprised by the quality of the tool. 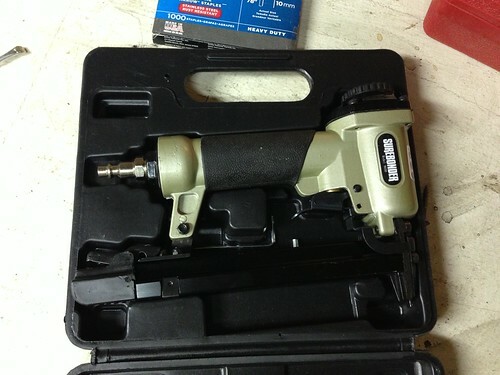 I don't know why, but for roughly $30 I expected a tool that was far flimsier and lighter than what I received. The weight of the tool is substantial and balanced. Beyond the initial feel in my hand, it seems sturdy, solid, and hopefully ready for years of use. As far as staples are concerned, the stapler allows for several different sizes and types. 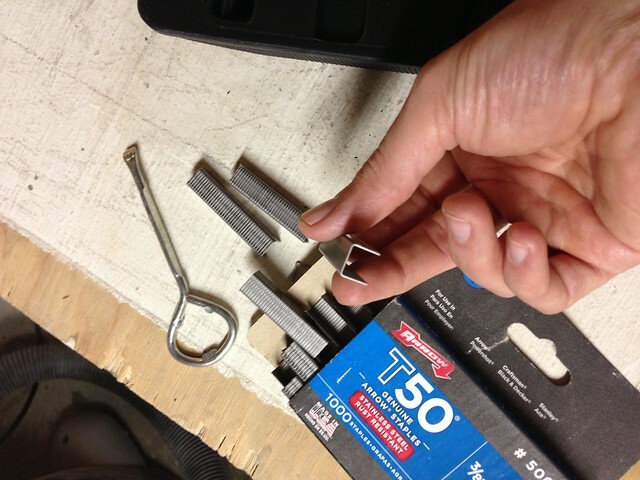 I purchased a box of additional T50 Arrow staples in 3/8" length, but already hand a box of 1/4" and 1/2" on hand from the electric and handheld staplers. In other words, there's no need to buy special staples for this gun, you can use the staples you may already have on hand. One very important aspect of using this tool is ensuring the pressure at the tool is limited based on the manufacturer's recommendation. 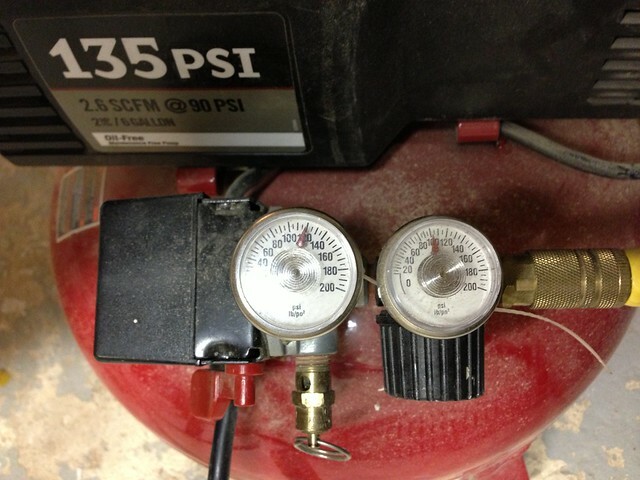 Our compressor allows me to adjust the maximum pressure allowed to reach the tool that's hooked up to the hose, in this case, 100lbs. When I ready to give it a go I placed my safety glasses on my face and the point of the stapler where I needed my first staple to be driven. When I was ready to place the staple I depressed the safety by pushing the device into the target, and nervously pulled the trigger (I was stapling into a family heirloom, after all). After a loud and telltale pneumatic tool pop and hiss, I looked down to see an absolutely perfectly driven staple. No crinkles or errantly placed ends, no partial hold, no ugly results, it was perfect! I couldn't believe the results or the fact that I had waited so long to buy this tool. I started thinking of the various places we could use it. So many options! 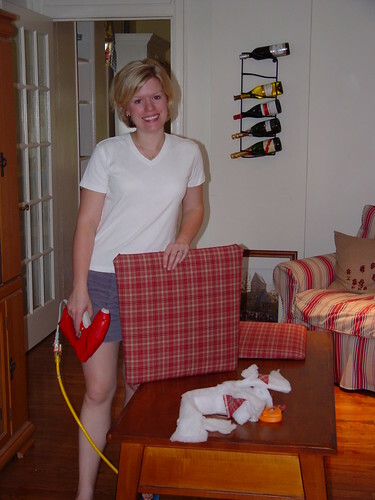 We could upholster anything with this gun. We're talking padded fabric headboards and ottomans! Oh, if only we had a larger house with more room for improvement. After using this gun to place about 70 staples in the fabric webbing and burlap of the chair, I'm more than pleased with our purchase. I'm hoping the staple gun will not experience the sudden, unexpected, and permanent seizing that appeared in a few of the reviews I read. In the worst case, if it lasts for a few thousand staples and then gives out, I could see dropping another $30 for a new one. I don't think I'll be using it nearly enough to experience any heartache over that. Only time will tell. 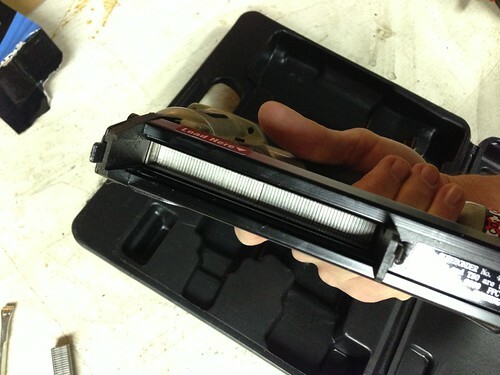 Do you have a staple gun that you swear by? Is it pneumatic, electric, hand held, or perhaps gerbil operated (I'm sure there are lots of random things out there)? Or maybe you're like me and have been waiting to find the perfect one. This is really good to know, glad you like it. I have an electric one, but have wanted one I can use with the air compressor for some oomph! Oomph is absolutely what this gives you. Looks like you were lucky to find one available for "Prime". I hit your link, and the only one available now has shipping. (As a fellow Prime member, I can't possibly pay shipping...) ;) Good thing I don't need one today! I'm totally a "Prime Snob" now. I won't order unless it's Prime or I absolutely and positively must have it and nobody else sells it. They pop up every now and again, I guess I did just get lucky though.